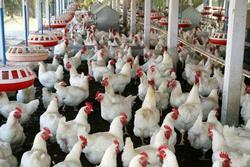 A Chinese firm in southwest Nigeria’s Ogun State has set up an integrated poultry farm in order to focus on enhancing the nation’s food security through commercial agricultural production. Mark Chen, General Manager for Eco-Green Farm, made this known in an interview with Xinhua in Ijebu-Ife, about 130 km from Lagos, the country’s economic hub on Monday. Established in 2011, the farm situated a rural area of Ogun State recognized poultry’s potential to create jobs and economic opportunities in Nigeria, Chen told Xinhua, noting that the Nigerian poultry industry still faces challenges as it continues its growth. “Recently this year, the Nigerian government encourages investment in agriculture, but in the past, probably the focus more on oil industry and neglects this part, but now they want to bring it up again,” he said. Chen told Xinhua that the company plans to increase it birds population from 60,000 to 250,000 by 2017 and introduced cassava farming soon.